Sibyl Stork works out of her studio in the Old Town area of Ft.Collins, Colorado. Her painting style utilizes experimentation and chance along with a firm knowledge of the medium. 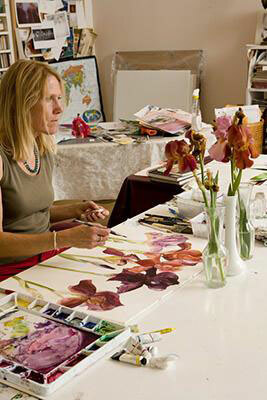 In her studio she also teaches watercolor classes where creativity runs rampant. “My interest is in finding ways to express what I feel, what dazzles me, and what stops me in my tracks. It’s an inner landscape that I paint, though I most often use the metaphor of nature to help me make those feelings visible. The shapes I am drawn to are those of unstoppable growth, which is for me, a kind of hope.